Patreon.com is a fun and simple way to help support artists and free-to-play websites like Goatlings.com! Become a Patron by pledging a small monthly payment of $2, $3, $5, $10, $15, or more! It's like a monthly tip that goes towards website expenses and keeping the site ad free! The first payment is processed right away, and additional payments will be processed at the beginning of each month. Your pledge can be edited or canceled at anytime. Click the banner below to visit our Patreon! 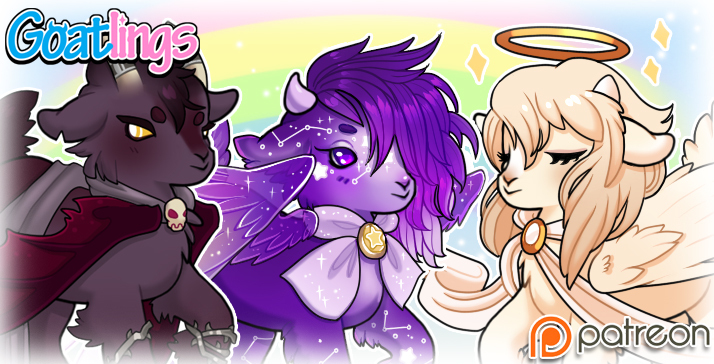 Each month fun rewards are given to Patrons as an extra thank you for their support! Rewards include; sneak peeks, preliminary work, behind the scenes stuff, speed-paints, giveaways, polls, and exclusive Dawn/Twilight/Dusk Lucky boxes (previews below)! Rewards such as Goatling Lucky Boxes are sent out in waves about twice a month with the first wave going out around the 10th. Thank you everyone for any type of support you show Goatlings.com! From supportive comments, contributing artwork, answering questions on the forums, and just playing/enjoying the site in general. THANK YOU ALL so much for being an awesome community we can be proud of!